Differences between the CS3 and the CS3 Plus: The CS3 does not ship with an S88 input port (although you can use your S88 modules with an adapter) and does not allow as much connectivity between multiple stations. The screen, memory, network interface, processor and software are all the same. This webpage has a very good rundown of the differences in easy to understand language. Connections for network, external speakers, Marklin Bus. Expansions can be connected by means of the Marklin Bus. 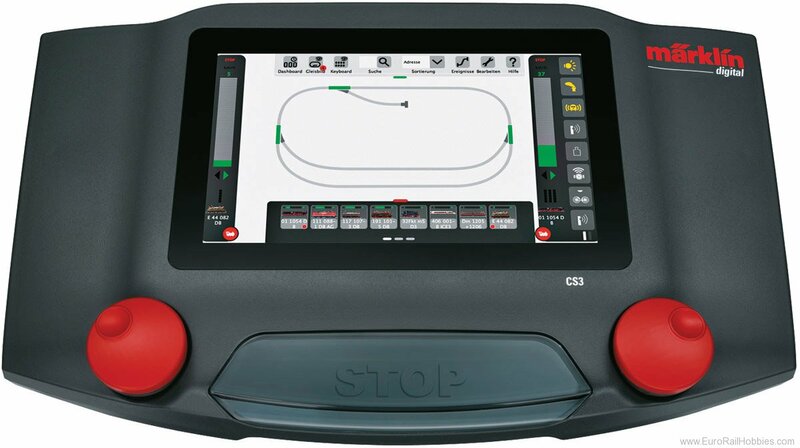 As a multi-protocol controller the Central Station 3 with its high resolution, modern color touch screen, 2 locomotive controllers as well as a built-in central track diagram control board offer the possibility of simple, easy control of locomotives and of the entire layout. Up to 32 functions can be controlled on locomotives, and up to 320 Motorola or 2,048 DCC solenoid items can be controlled among accessories. In addition, the Central Station 3 has 2 built-in locomotive card readers (for saving locomotive data on a locomotive card or for fast call-up of the locomotive by plugging in the locomotive card), an SD card slot for expanded storage as well as a built-in speaker for playing back typical model railroad sounds. A powerful Booster is built in to power the layout with current for trains and for accessories. The Central Station 3 is multiple device capable, i.e. several Central Station 3 plus (60216) units can be operated together on a layout with the optional cable (60123). Additional locomotive controllers, additional Layouts, and Keyboards expand the operation of the layout whereby joint and separate configurations can be maintained in the Central Station 3 (plus) for the layout areas to be controlled. The Central Station 3 has 2 built-in USB hosts (such as for a mouse, keyboard, USB stick), a USB loading socket, a network connection for communication with a PC, connections for 2 Mobile Stations, a connection for external speakers as well as others for the Marklin Bus system. S88 connections can be done externally by means of the Link s88 (60883). Load capacity at the feeder track: max. 5 amps, load capacity at the programming track: max. 1.2 amps. When using the 60061/60065 switched mode power pack there is a maximum output of 58 VA and a maximum current of 3 amps (when using the 60216 with the 60101/L51095 switched mode power pack there is a maximum current of 5 amps, recommended only for 1 Gauge/LGB. Please make sure that the wire cross section for your wiring is at least 0.5 square millimeters / 20 gauge or larger!). Dimensions 320 x 195 x 80 mm / 12-5/8" x 7-11/16" x 3-1/8".